Clothing/Jewelry Description A green Girl Scouts t-shirt, blue denim shorts and white leather sneakers. Distinguishing Characteristics Caucasian female. Blonde hair, blue eyes. Morgan had five visible silver caps on her molars at the time of her 1995 disappearance; the caps were scheduled to be removed in 2000. 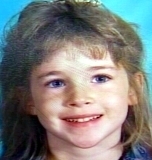 Her teeth were crowded at the time of her 1995 disappearance and she would have needed orthodontic braces in adolescence. Morgan has a protruding purple vein on the lower left side of her rib cage. Morgan attended a Little League Baseball game with her mother in Alma, Arkansas on June 9, 1995. She joined her friends to catch lightning bugs near the baseball field later in the evening. Morgan was last seen at approximately 10:45 p.m. as she stood near her mother's Nissan Stanza in the parking lot. She was emptying sand from her shoes at the time. She has never been heard from again. Witnesses told authorities that they observed an unidentified Caucasian male watching Morgan play on the field earlier in the night. The man apparently approached a group of children playing with Morgan and asked them a question; investigators have not publicly released any additional details about the conversation. The suspect is described as being approximately 23 to 38 years old in 1995, 6'0 and 180 pounds. The suspect had black or salt-and-pepper hair, which was combed to the back and possibly curly, and he had a mustache and three to four days' growth of beard. He also had a hairy chest. He wore cut-off blue jean shorts and no shirt or shoes and spoke with a "hillbilly" type dialect or accent. Sketches of Morgan's alleged abductor are posted with this case summary. The unidentified man may have been driving a red Ford pickup truck with a white camper, which had windows covered with curtains. The vehicle left the field's parking lot at approximately the same time Morgan disappeared. The truck had a dull paint job due to age, and a short wheel base. The camper was possibly damaged on its right rear end. Witnesses stated that the camper appeared to be four to five inches shorter than the truck. Two attempted abductions occurred in the general area on June 9 and 10. 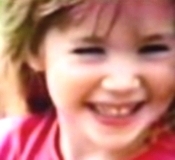 In Alma, a suspect resembling Morgan's abductor enticed a four-year-old girl into his red truck. The abduction was interrupted and the girl saved when her mother saw them and screamed. In Fort Smith, fifteen miles from Alma, a suspect tried to entice a nine-year-old girl into the men's restroom at a convenience store. He stopped when the girl resisted. Authorities announced that the incidents both involved the same man. While the individual involved in these incidents has not been confirmed to be the same man sought in Morgan's case, he resembled the suspect in her disappearance and so did his truck, and authorities believe the events are linked. There have been unconfirmed sightings of Morgan throughout recent years, but she has not been located. The suspect and his possible vehicle remain at large. Updated 8 times since October 12, 2004. Last updated June 27, 2015; age-progression updated.